Aqua minerals consistently provide the sand with ideal angularity, size, spherity and hardness for the most efficient filtration of water. Extracted from a clean glacial sand deposit, Aqua sand physical properties make it among the finest available in the world for filtration applications. Aqua water filtration sand is double washed, kiln dried, and screened to meet different specifications with strict adherence to quality control. Aqua sand used extensively in water filtration (ETP, WTP, STP), water harvesting and borewell. 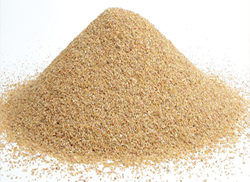 We provide sand with different sizes as per buyer's specification.